SP-6814 : Fix for incorrectly reporting syntax errors when attempting to refactor scripts. SP-6819 : Fixed an issue in ALTER TABLE DROP where no columns or constraints would be suggested after selecting the first one. SP-6918 : Fixed a problem that could cause "Inline EXEC" refactoring to fail with a crash dialog. You can now refactor INSERT statements into UPDATE statements, making it easier to update the data in your tables. This can be triggered by either right clicking in the script window and selecting the command, or by using the keyboard shortcut Ctrl+B, Ctrl+P. The refactoring automatically adds a default WHERE clause, which you can customize to suit your needs. For more information, see here (UserVoice). You can now go directly to the Product Learning section of the Redgate Hub from within SQL Prompt. Click SQL Prompt > Help > Product Learning to find how-to guides, in-depth technical articles and videos to help you uncover 'hidden gems' and make the most out of SQL Prompt. 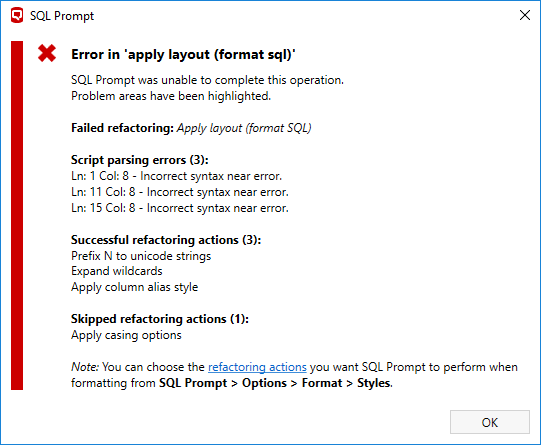 SQL Prompt documentation now contains a list of all keyboard shortcuts available within the product, to help you be more effective. When problems occur during formatting, the formatting actions that were successfully executed and those that were skipped are now displayed along with the failures. SP-7208 : Fixed insert semicolon refactoring when merge statement was used as table source.